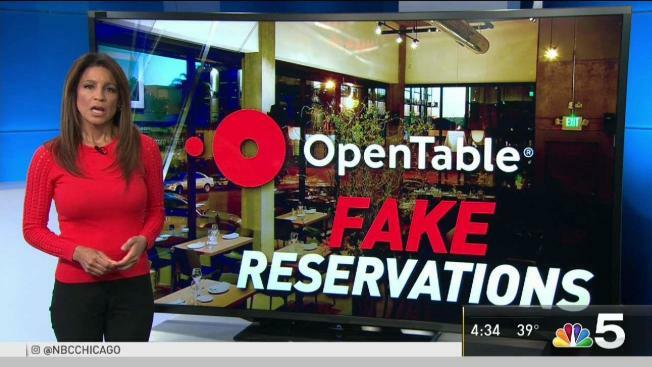 This week, popular restaurant reservation website Open Table fired what it called a rogue employee who made hundreds of fake reservations. Now, one of the restaurants involved is speaking out. NBC 5's Chris Coffey has the story. Restaurant employees get excited when they see large groups of customers walking toward tables. After all, larger parties generally result in more tip money for the workers. “I’m a mom so this is my only job and that’s how I actually am able to pay for school and all the other stuff life throws at me,” said Patricia Gjurobski, a server at Tavern at the Park in downtown Chicago. But since last December, a number of potential customers have “no showed” their reservations at Tavern at the Park and dozens of other Chicago restaurants. That’s left restaurant owners and their employees feeling the impact. “Not only do we have the walk-ins kind of upset because they were waiting, but we are also upset as well because of income,” added Gjurobski. An OpenTable employee has been fired after making hundreds of fake reservations at dozens of Chicago restaurants while using a rival company’s platform. That was especially evident at Tavern at the Park this past Valentine’s Day. “How many people have we turned away and what’s happened to the pocket books of our staff?” said owner Peter De Castro. De Castro said he formerly utilized the reservation services of OpenTable to attract more customers. But in recent years he switched to a service called Reserve. This week, however, OpenTable said it learned that a rogue employee had made a few hundred false reservations at 45 Chicago restaurants using a competitor’s platform. According to CEO Christa Quarles, OpenTable quickly investigated and confirmed the employee had acted alone and was not in a sales function and had no managerial duties. The employee was terminated within 48 hours and Quarles issued an open letter in which she apologized to the restaurant community. “This action absolutely does not reflect our mission of helping restaurants grow and thrive, and we will continue to work hard to earn the trust and respect of the OpenTable community every day,” Quarles wrote. OpenTable is offering reimbursements to restaurants, including gratuity. De Castro said he declined the offer because he is waiting on exact data that shows the financial impact to his restaurant and employees. He also questions how so many false reservations were made.